Enquire or book a trip along Cần Đước - Cái Bè - Chợ Mới. Departure from Cai Be upstream through Mỹ Thuận bridge then Sa Đéc while lunch is served on board. The Bassac enters the river of the Tiger then drops the anchor for a visit of a XIXh century monastery. Dinner is served as the Bassac gets under way towards the Northern part of Chợ Mới. 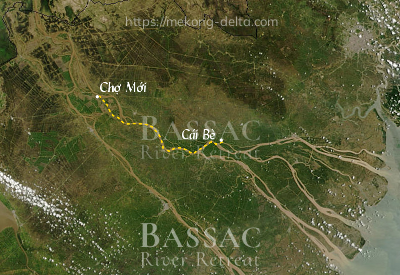 The Bassac continues to cruise upstream Tien Giang river towards Vàm Nao. Checking out of the cabins and transfer onto a local boat for a visit of a village North of Chợ Mới, not far from the main temple of the Hoa Hao sect. Disembarkment at Cho Moi ferry. End of services by mid-morning on shore at Chợ Mới.